As I lay dying, she walked me through her garden. Where I was, it rained, and I felt the coursing streams of the street run around my body. 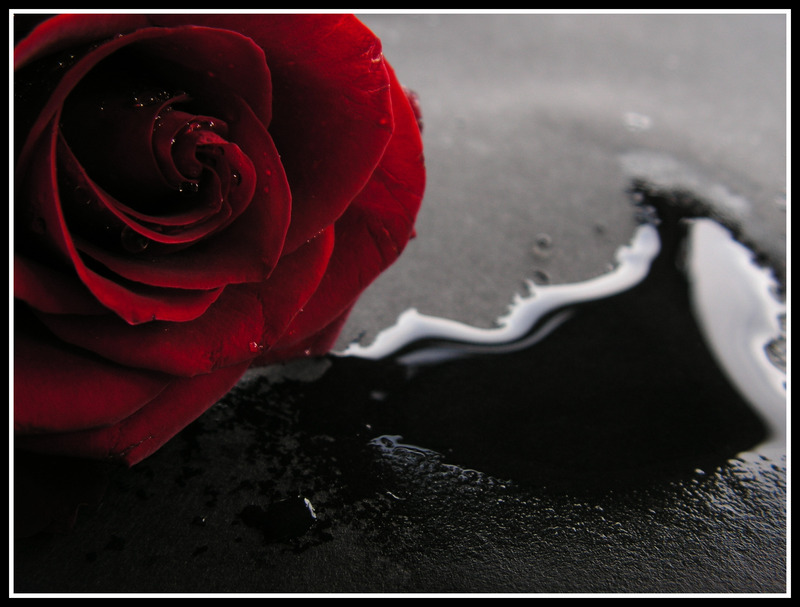 Over my heart, the spreading stain of blood unfolded like a rose, a dark red boutonniere to complement my suit. The gunman returned his revolver, the sagging cigarette in his mouth producing a mournful blue streak of smoke. Tipping his hat, he stepped out of the rain back into the steaming kitchen he’d materialized from. A chief spared a curious look at him and then my body. Forcing his gaze back to the cutting board, he continued chopping vegetables. The chop-chop-chop of his knife ticked away the seconds of my life as I walked through her garden. It was a beautiful day, an hour before the heat of noon, and gentle breezes, like playful children, ran among the plants and bushes, shaking the limbs of trees and kicking up piles of dried leaves. At my side she walked, and her solemn eyes stared forward, at times glancing to some daffodil or patch of daisies, but always returning to the path ahead. I knew where it was we walked, and hoped to dissuade her course. Before us a trail led from the pathway toward a little pond where her lilies let their peaceful, white petals stretch in the gentle sun. I stepped upon this branch, this unpaved footpath, but her grip tightened like a vise of steal. Arrested, we stood silently a moment. Wistfully gazing upon the tranquil drink, the still water, as reflective as glass, lent me a vision of the patchy sky where lazy clouds rolled on in their never ending circuit. The grip was tighter now, and the two pains fought within me. I yearned desperately for the pond, and longed after it as if my whole body willed me to go there. I longed for it as a young man longs for his love. But she had my arm, this garden-keeper, this eternal bailiff, and she tore me from my love. And down the path we trod to the center of the garden. A hedge-maze was to my left, and in it I could spy the tops of many heads wandering ceaselessly. “Who are they?” I whispered, for you whisper in that garden of dreams. “None of your concern,” she replied curtly. It was only moments now before we came to the rosebush. The vibrant red heads, couched in leafy dresses, were in full bloom. The curved stalks gently swayed in the playful breeze passing by. She didn’t say anything, but let go of my arm. It grew from a pile of mulch. A retched odor of death pervaded all. A solitary petal, its red so dark it was almost black, fell, tumbling in an ordered chaos, a twisting, coiling path leading inevitably down. It landed upon a skull, itself blackened by timeless mold. The petal soon withered from existence into dust. Careful not to step onto this death, I eased ever closer to the rosebush. The thorns were what I truly feared, and the swaying vines threatened to catch me in a sudden turn of wind; with that prick I’d die. I watched a blue beetle, a small glimmering creature, weave along the rose-stalks unafraid of the deadly pillars it circumnavigated. To be so small. The branch swayed up and down, and I looked among the thorns for some unguarded patch by which to catch the flower. “Is there some other way,” I said, drawing my hand back. “I would some other challenge, or no challenge. I would go my way back to the pond. Turning around, I found that I must have come into the maze. Though as the woman led me, the path seemed straight, now it was hedged, and my heart beat heavily to see the hopeless convolutions of that garden. She crossed her arms, and said not a word. I returned to the rosebush. My hand reached forward, and stayed but a breath from the deadly touch. The beetle had stopped, and was resting. Its glinting body, the angle of light shifting as the branch swayed, changed in tones from the deep blues of the ocean to the light azure of the day lit sky. But it was one or the other, for the swaying vine never paused between those two extremes. There was a moment at either end where a man might try to grasp the rose of death. Grasp it, yes, but where along that stem could I place a finger without receiving that deadly prick? And there it was: just by the bloom itself, where flower and stem combined, a small space could be grasped where no thorn protruded. I waited, and watched the oscillating stem. Up, then down, and up again it went. Up, then down. Up, then down. And I snatched it! I held the rose pinched between my fingers. The flower came from the plant with a strange easiness, and with a racing pulse I brought the prize towards the lady of the garden, careful even here to keep the thorns from touching me. With widening eyes, she stepped back, her arms uncrossing as she felt behind herself. Stopping herself, she stood tall, and her face eased back into the expressionless solemnity I had known. “Well done,” she said. I felt my hand with the rose trembling, and carefully brought my second to support it. As she talked, I remembered the beetle, how it had easily maneuvered around the deadly thorns. My thumb likewise began to move along the stem, running between the pricks. A large one felt rougher than the others, and as my thumb moved near it, I could feel it give as if it were loose. “Follow me,” she said. She turned, and began to walk into the maze.